Omega Steel offers a wide-range of API line pipe products. 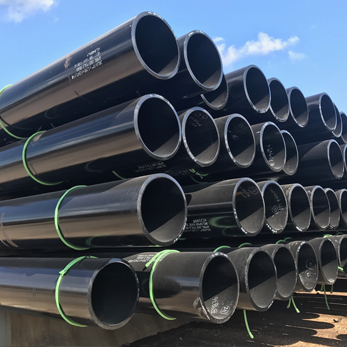 Our worldwide network of API line pipe suppliers allows us to offer exotic heavy X-grades (X42, X46, X52, X56, X60, X65, X70) from an assortment of producers, giving our customers the options they need to complete their projects. Because of our relationships with mills both domestic and foreign, our size range is virtually limitless. Contact us today for your API line pipe needs. Outside Diameter: .405" - 84"
Wall thickness: .068" - 2.05"
Wall Tolerance < .157" (Seamless): .024" - .02"
Wall Tolerance > .984" (Seamless): +.146" -.120"
Wall Tolerance < .197" (Welded): +/-" .02"
Wall Tolerance > .591" (Welded): +/- .06"
Wall thickness: .068" – 2.05"
Wall Tolerance > .984" (Seamless): +.146" - .120"